Artificial intelligence (AI) has been finding its way into more and more areas of our daily lives, and interest in the subject has been growing continuously. But in spite of the many AI-based innovations that have emerged, school curricula are still not giving AI the focus it deserves. 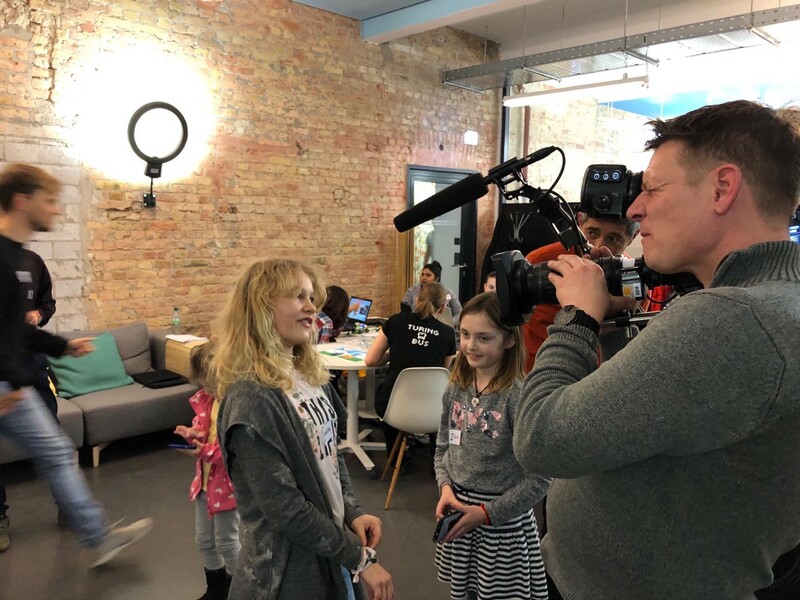 One of her workshops took place on Jan. 21, 2019, in the Hub:Raum Café, a Deutsche Telekom event location in the Berlin Schöneberg district. For the event, Druga received support from Telekom Innovation Laboratories (T-Labs) and Deutsche Telekom IT GmbH as well as from the Weizenbaum Institute for the Networked Society. T-Labs also contributed snacks and refreshments, giveaways and child-appropriate magazines with information about artificial intelligence. At the beginning of the event, Druga introduced herself and her work to the participating children and their parents. Over the past few years, she has developed an AI platform for children that teaches programming through play by programming blocks building on Scratch, the most popular coding platform for kids. Cognimates extends Scratch to AI education by allowing kids and parents to test out different AI libraries and build games with them. Through that, children learn to do such things as program robots and AI models. Most of the blocks are oriented to simple AI applications. For example, kids and teach the computer how to play rock-paper-scissors with them or use a library to analyze the sentiment of their speech. Cognimates is an open source platform that includes extensions for various types of robots (including Vector, Cozmo and Lego Wedo) and can be expanded on the GitHub software development platform. Currently the platform is being translated to German and many other languages. After hearing Druga’s introduction, the children were asked what they think about artificial intelligence and how they would explain what it is. These questions were taken up again later on during the workshop. The children then moved through a series of stations at which they learned about different robots and AI-assistants which were installed on different tables (stations). At one station, for example, they conversed with Alexa, used the Cognimates platform to make minor changes to her programming and learned about Alexa’s capabilities in general. At two other stations, the children played with the robots Cozmo and Vector by the robotics and AI firm Anki. At first glance, the two robots appear very much the same. Vector is not programmable, however, and carries out all computations and analyses autonomously. Cozmo is programmable, and forwards all queries and audio tracks to a cloud for analysis. As a result of its autonomous features, Vector is slightly slower than Cozmo. The key difference between the two robots was especially interesting for the parents — in terms of data protection issues, which were of little interest for the children, who immediately moved to interact with the devices. The Cognimates platform also includes tools for programming and remotely controlling the Lego Wedo system. 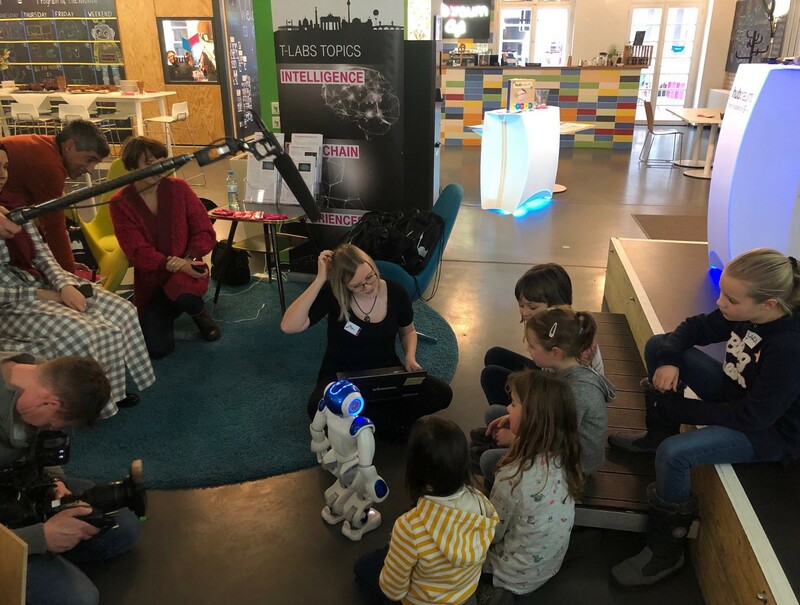 Lisa Anders from Telekom Innovation Laboratories made an NAO robot available for the event, in order to give the children the opportunity to experience the interaction with a humanoid robot. They were able to teach it movements and communicate with it in English. An interesting aspect that emerged at the NAO station was that the children immediately accepted the NAO as an equal and said that they could imagine having him as a playmate. The children could spend 10 minutes at each station before heading to the next one. At each station, the children were asked a number of perception questions shortly before they moved to the next station. The questions, which they answered by placing a Lego block on a picture, were designed for assessment of their impressions of each station. Each picture showed two monsters with two different opinions to enable discussion. The children placed Lego blocks on the pictures to show which monster they thought was right. The questions posed for discussion included “Do you think this robot is more intelligent or less intelligent than you are?”; “Do you see the robot more as a friend, or more as a teacher or someone like your parents?”; “Is this robot more like a person or more like an animal?”; and many other questions. The children influenced each others answers and very often would debate in detail what does it mean for a robot to be friendly or if they should or should not trust it. The event was filmed by ARD, as part of a documentation called “Der große Umbruch”. The event closed with a big round of discussion with the entire group, including both children and parents. The topics covered in depth included robots in everyday life, AI in the future, fantasies and concerns, and potential applications. An interesting aspect that emerged from the discussion was that the children seemed to have great difficulty distinguishing between artificial intelligence and the hardware that was being used. Nearly all of their answers referred to use of AI in robots, aircraft, self-driving cars and other applications involving specific types of devices. Some children had already developed very specific ideas, ranging from robots that would handle tasks such as shopping or washing dishes to robots that could serve as long-time playmates. At the same time, many children, and many parents, expressed concerns that such devices could take the place of human contacts and friends, and they added that such developments would contradict the basic purposes of technology. One girl expressed a sentiment that if children spent time only with robots, the children without robots would have no one to play with and would then be very sad. She added that she would rather see all children have friends than just play with robots. All such concerns notwithstanding, the parents repeatedly emphasized that they felt schools were still giving too little attention to the subject. In addition, they found it very positive that the event also gave girls the opportunity to explore the new technologies. Some of the children expressed their desire to learn how to program and “teach” the robots or the computer more in future sessions. While we recognized that parents are rightfully concerned with AI technologies entering their lives we try to provide a playful yet useful way for families to learn how AI works and when and how best to make use of it. 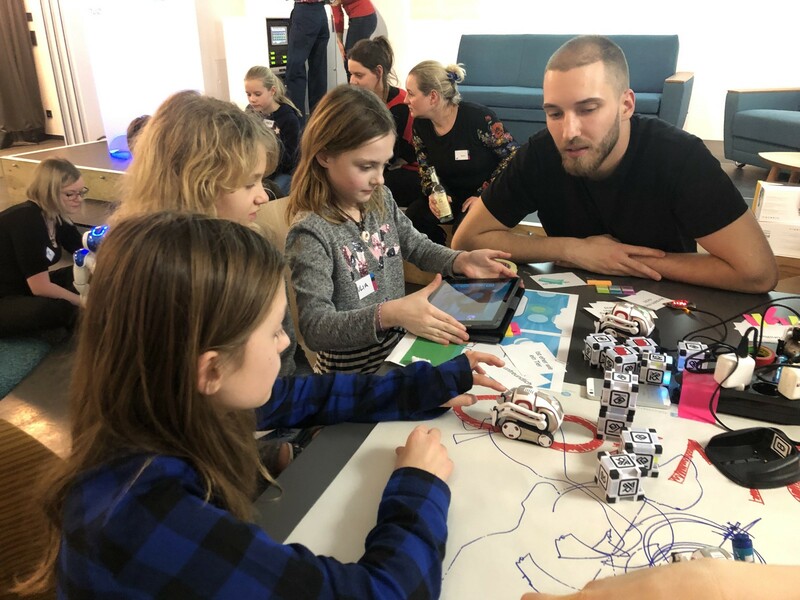 The Cognimates team will be organizing several future “AI for Kids” workshops and camps in Berlin this summer and if you are interested to participate please sign-up. Through this initiative, we hope to inspire families to dream of a better future with AI and give them the tools to build it. “We find that this is important for young people. It was most interesting to see how curious children really are. In their world, robots and machines are already part of their daily life. We received very good feedbacks and enquiries from numerous cities. There are many upcoming events we are thinking about, e.g. IT@school. It is our responsibility to enable children worldwide to engage with artificial intelligence “, says Claudia Pohlink, Head of Artificial Intelligence at T-Labs.